The super PAC behind a $1.5 million New Hampshire television ad blitz for Jon Huntsman has been quietly benefiting from the fundraising muscle of lobbyist Tom Loeffler, who until recently was a top Huntsman campaign official. Back in September, Loeffler — a former Texas Congressman — was a senior adviser to Huntsman’s presidential campaign and briefly served as its chairman. But Loeffler told iWatch News that about two months ago he left the campaign — where donations are restricted — and shifted to raising unlimited funds for Our Destiny PAC, the super PAC that’s supporting Huntsman. “I had to sever my ties with the campaign,” Loeffler said in reference to the presidential effort for Huntsman, the former Utah governor and ambassador to China. Loeffler’s move is the latest sign of the apparently tight links between presidential campaigns and allied super PACs, despite laws barring “coordination” of various activities, especially advertising. Federal Election Commission rulings, though, have allowed considerable leeway on the fundraising front, campaign finance lawyers say. Other super PACs helping candidates have also gotten financial boosts from former campaign aides who jumped ship to join the PACs. This past summer, Steve Roche — who had been a top fundraiser for the presidential campaign of Mitt Romney — departed that post to spearhead the money chase for the super PAC supporting Romney, Restore Our Future. Campaign finance watchdogs have been raising alarms about the apparent linkages between presidential super PACs and campaigns. “It’s another example of how these candidate-specific super PACs are really functioning as arms of the campaigns themselves,” said Fred Wertheimer, the president of Democracy 21. Super PACs backing presidential candidates have mushroomed in the wake of last year’s controversial Supreme Court decision, Citizens United v. Federal Election Commission. The ruling allowed corporations, individuals and unions to write unlimited checks for ads and other campaign tools in support of or opposing particular candidates. 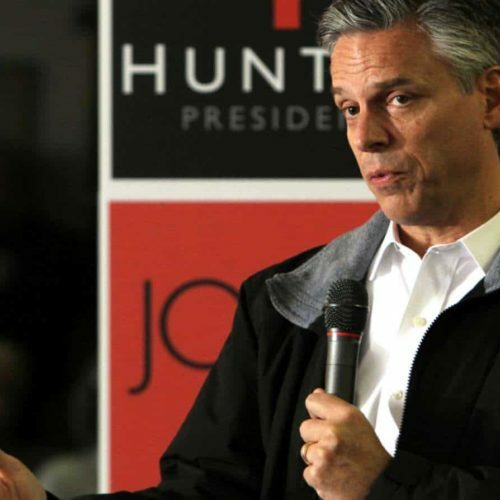 Loeffler’s move underscores the big bet that Huntsman allies are placing on raising large sums to help him catch or surpass top tier candidates — especially his effort to overtake Mitt Romney in the New Hampshire primary on Jan. 10. Asked about how fundraising is going, Loeffler said, “You have to keep calling. Persistence pays.” Given that Loeffler was a major bundler for the last three GOP presidential nominees, Huntsman stands to reap substantial dividends from his shift to the super PAC. The new super PAC ads began airing in the Granite State last week and will run through Thanksgiving. One of the ads contrasts Huntsman’s record as Utah governor with Rick Perry’s record in Texas. The ad also contrasts Huntsman’s stand on issues with Mitt Romney’s positions in an effort to portray Huntsman as a more consistent conservative. Our Destiny could be crucial to Huntsman’s chances since recent reports say his campaign has spent virtually all of the $4.5 million it raised. News reports have indicated that Huntsman’s father, a billionaire who made his fortune in chemicals, pumped funds into the super PAC. Loeffler, who recently joined the powerful law and lobbying firm of Akin Gump Strauss Hauer & Feld after a long career representing blue chip firms foreign clients, did a stint as a finance co-chairman for the presidential campaign of John McCain. His clients at the Loeffler Group, one of his earlier firms, included Saudi Arabia, Hong Kong and the state of Hidalgo Mexico. Loeffler resigned as a volunteer from the McCain campaign in May 2008 after it established conflict-of-interest policies regarding lobbyists and foreign agents. In early September, when the Huntsman campaign announced that Loeffler was becoming chairman, it was seen as a coup, since the lobbyist had previously been a major donor for Texas governor Rick Perry. Romney’s super PAC, which was started first, is the only one of the GOP groups that has thus far been required to report fundraising totals and donors names to the FEC. At the end of the first half of 2011, Restore Our Future had raised just over $12 million. Restore Our Future, which has not yet run ads, was formed by three close Romney allies who worked on his 2008 campaign. This summer Romney attended — and spoke briefly at — a New York dinner hosted by his super PAC for big donors and potential donors. The FEC has specifically barred candidates from making requests for unlimited checks, but they’re allowed to ask for donations of up to $5,000 per person. Make Us Great Again, the presidential super PAC allied with Texas governor Rick Perry, has been running hundreds of thousands of dollars of television spots for several weeks in Iowa and South Carolina in an effort to give his lackluster candidacy a shot in the arm.